Avocado: Rich in Vitamins A, B, G and E which makes it a wonderful moisturizing treatment for dry and damaged skin. Macadamia: Offering a near-identical sebum profile, it is rich in fatty acids and cortisone-like protective phytosterols that help to regenerate, and boost hydration. Rosehip: A rich source of trans-retinoic acid and omega 3, 6 and 9 for skin regeneration. Clinically proven to effectively erase stretch marks, age spots, and fine lines. Carrot: Helps to repair damaged skin tissue, address skin discoloration, improve complexion, tone and add elasticity to the skin. Turmeric: helps to soothe acne and skin inflammations. Offers calming, antioxidative, detoxifying and anti-carcinogenic characteristics. 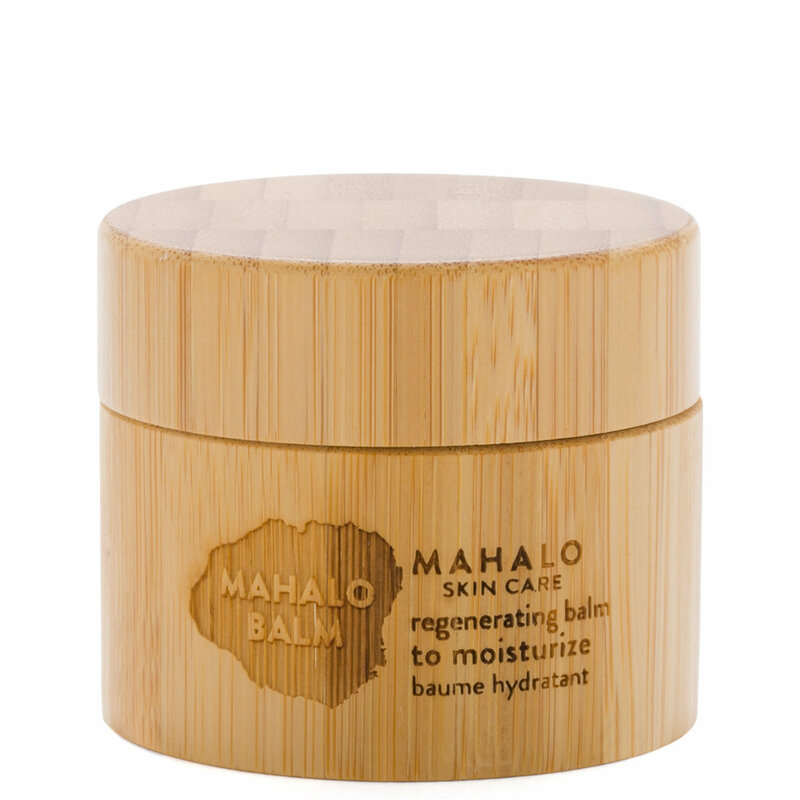 The big kahuna of moisturizers, this golden balm transforms into a do-it-all skin potion upon application. Formulated with a water-free combination of skin-saving ingredients, such as macadamia, rosehip, and turmeric, The MAHALO BALM addresses all of your pressing skin concerns from premature aging to acne inflammation. With notes of turmeric, jasmine, and bergamot, this herbaceous emollient balances and calms your mood while giving skin some TLC. Gently massage a small amount on wet or dampened face, neck, and décolleté for maximum oil absorption. Can be applied under your eyes as a nighttime treatment to fade wrinkles and control puffiness. First off, I am not one to spend $90 on many things.. a moisturizer included. BUT I’ve struggled for years with dry patches and dry skin that is sensitive and breaks out when I try to use heavy moisturizers. This balm does it all. It has cleared up my skin as well as evened out my combination and mostly super dry skin. I’m loving this!! This product is highly packaged it has some interesting properties. When your fingers touch it it becomes very viscose so it goes on smoothly and stays in place. Like the serum it does not absorb quickly. I find the odor on this to be neutral. I love everything about this product except for the smell. For me its overwhelming, this may not be the case for those who enjoy a strong earthy scent. Aroma aside, the balm is rich, feels incredible on, and a little goes along way. I can see this product lasting for many months, which makes it easier to justify the price.